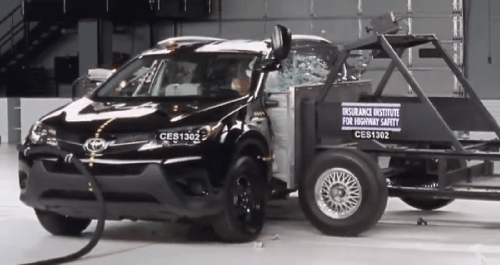 The new RAV4 has been crash tested by the Institue For Highway Safety and the results are a big relief to Toyota. The newly redesigned 2013 Toyota RAV4 has earned Top Safety pick status from the Insurance Institute For Highway Safety (IIHS). The IIHS has now tested all of the current redesigns of the very popular compact crossover players in the market. The test was an important one for Toyota because the long-time sales leader in the segment is under pressure from the hugely successful new Ford Escape, long-time rival Honda CR-V, and the upstart underdog favorite, the Mazda CX-5. In order to earn this top spot Toyota made important changes to the RAV4 detailed below. The changes to the rear of the vehicle were important for customer preference and also insurance cost reasons. All earlier model years of the RAV4 hung the spare tire on the tailgate. The tire was low enough to overlap the rear bumper. That meant that if the owner of the vehicle backed up into a garage pillar, or a service station guard rail the spare tire assembly would be pushed into the tailgate. This minor bump could cost the owner thousands in repairs. However, the new design moves the spare to a more sane location in the vehicle, underneath the rear storage area. Therefore some rear impacts can be repaired more simply, and significantly less expensively. In order to compete in this family friendly vehicle segment a Top Safety pick is almost a requirement. The new Ford Escape, Current Honda CR-V, the Subaru Forester, and the new Mazda CX-5 all have earned Top Safety Picks. Toyota could not afford to be the standout in this crowd with anything less than a Top rating. The tests of all of these vehicles do not include the new “small overlap” test. This new test is recently introduced by the IIHS. Noting that some seemingly minor accidents, in which the car does not have a full half of the front of the vehicle involved, were resulting in major injuries and high frequency of fatalities, the IIHS did an investigation. It learned that when a car hits another car or stationary object like a tree, and one of the front frame rails is not impacted, the damage and passenger injuries are very bad. Therefore, it has started using a new test. It is now rolling out and when the results of this new test are in for these vehicles TN will update our readers.